WALTHAM, MASS. ; JUNE 14, 2016 (Business Wire)---Frenova Renal Research, the world's only drug and medical device contract clinical development services provider dedicated exclusively to renal research, announced today the inaugural group of high performing site businesses which comprise F1RST Up (Frenova Rapid STart Up), a program that accelerates study startup by eliminating the administrative and contracting burdens often cited as primary reasons clinical trials are delayed. 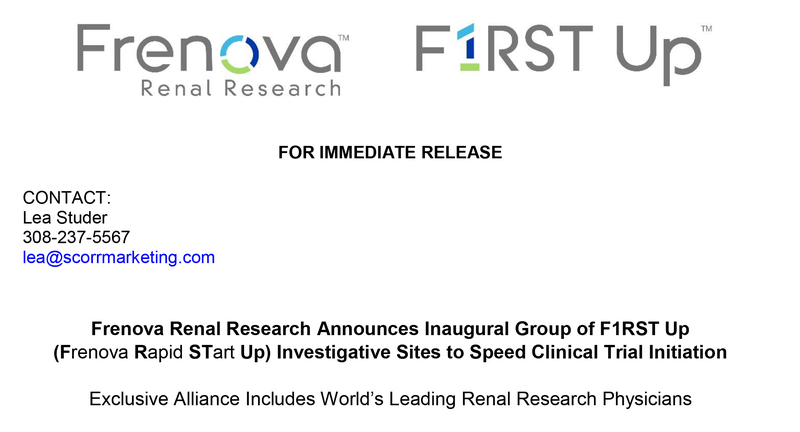 "The founding membership in F1RST Up includes some of the most productive clinical research sites In the world or renal research,' said Kurt Mussina, general manager or Frenova. "We are thrilled to bring about F1RST Up in partnership with such an esteemed group of physician investigators. In Just the first few months since we launched F1RST Up, our cycle time metrics on contracting, site initiation and first patient enrolled already show the enhanced value we are delivering to the alliance sites and to Frenova's sponsor clients." Frenova Is the world's only drug and medical device contract clinical development services provider dedicated exclusively to renal research. As a Fresenius Medical Care North America company, Frenova manages a networked system of clinical research assets and resources including more than 200 principal investigators and over 400 research-experienced dialysis facilities. Frenova manages clinical trials in kidney and Its adjacent disease areas and medical conditions. Frenova also offers clinical trial sponsors access to over 180,000 active dialysis dependent CKD patients and 400,000 active non-dialysis dependent CKD patients. For more information, visit www.FrenovaRenalResearch.com.